Barbed wire was instrumental in taming the Wild West. Many fences utilize barbed wire as an extra mechanism for security. While fences have been used throughout human history as a practical way for containing livestock or indicating property perimeters, the barbed wire fence is actually a relatively recent invention. Barbed wire is also a uniquely American innovation. Read on to learn more about the fascinating history of barbed wire. The year is 1873. County and state fairs were popular as stages for displaying new inventions. At the county fair in DeKalb, Illinois, the barbed wire fence was born. A local inventor by the name of Henry M. Rose had on display a prototype of the barbed wire fence. His idea was to attach a row of metal spikes to the beams of wooden fences as a more efficient way to prick livestock that came too close to the fence, thus discouraging the animals from breaking the fences and escaping. The novelty and ingenuity of the barbed fence caught the attention of three men: Joseph Glidden, Jacob Haish, and Isaac Ellwood. Each man began working individually on his own version of the barbed fence that transmuted the idea of a barbed fence rail to barbed wire that could be attached to the fence. Glidden and Ellwood combined their efforts in 1874 to create The Barb Fence Company. Haish, who continued to work independently, was frustrated that Glidden and Ellwood had teamed up together. Wanting the recognition of inventing the fence for himself, he took efforts to file his patent and submit interference papers against Glidden and Ellwood. After and intense legal dispute, Haish was awarded his patent, but Glidden had won the legal dispute. Haish began calling himself “The Father of Barbed Wire”, but it was ultimately Glidden who would go down in history as the inventor of the prototypical barbed wire that became the barbed wire we still use today. 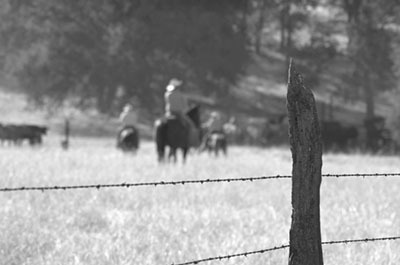 Barbed wire fences quickly rose in popularity as the fencing of choice for many landowners with livestock. At the time, cattle were allowed free range for grazing. Laws were instituted that put the onus of fencing out the cattle on the landowners of crops. At the same time, railroads were responsible for fencing off their tracks to dissuade cattle from walking across them. Since landowners were responsible for building their own fences, many of them stole barbed wire from the railroads. Since The Barbed Fence Company was selling such a large amount of barbed wire, it was impossible to trace who the thieves were. Thus, variations on the classic barbed wire were born. The railroad had a special barbed wire so that anyone who stole it would be easily singled out as the thief. Despite no longer being able to steal barbed wire from the railroads, farmers continued to build fences with barbed wire. Thus, barbed wire played a crucial role in taming the Wild West, and it is still used to this day. This entry was posted on Sunday, November 22nd, 2015 at 7:17 pm. Both comments and pings are currently closed.